Shinjuku is one of the 23 wards of Tokyo, and it is home to a large shopping and entertainment district surrounding Shinjuku Station. 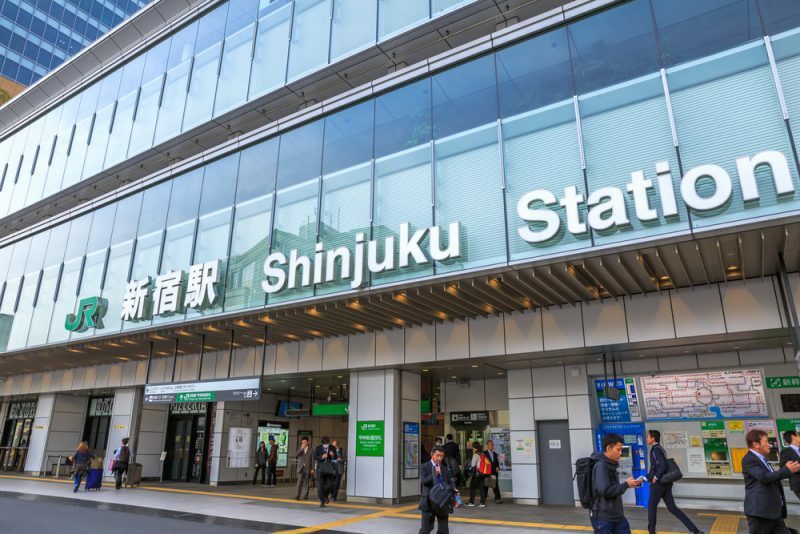 Shinjuku is the busiest rail station in the world, with more than two million passengers gracing its corridors each day. Shinjuku is a station with a long history. It first opened in 1885 on what is now the Yamanote line. Additional lines brought an influx of commuter traffic, urging the city’s growth. The area has also become a hive of popular culture. Landmarks in the area, including the station itself, have featured in the 2003 film Lost in Translation, the Digimon Adventure childrens’ animation franchise, and in a Carl Randall painting now on display at the National Portrait Gallery in London, England. Your Japan Rail Pass makes travel in and around Tokyo simple and affordable. The following trains are available at Shinjuku Station. There are no Shinkansen terminals at Shinjuku Station. However, you may take the Yamanote Line to either Tokyo Station or Shinagawa Station to use the Shinkansen bullet train. The Yamanote Line, a loop line serving Tokyo’s major train stations and attractions, including Ueno, Tokyo Station, Shibuya, Shinagawa and Ikebukuro. The Chuo Main Line, offering Limited Express trains to Kofu and Matsumoto. The Chuo Line Rapid to Ochanomizu, Nakano, Tachikawa, Takao, Hachioji, and Tokyo. The Chuo-Sobu Line to Suidobashi, Chiba, Nakano, Mitaka, and Akihabara. The Shonan-Shinjuku Line, serving the Tokaido Main Line, Takasaki Line, and Yokosuka Line, to Odawara, Kozu, Hiratsuka, Chigasaki, Fujisawa, Ofuna, Zushi, Kamakura, Takasaki, and Yokohama. The Saikyo Line, also called the Rinkai Line, to Shin-Kiba, Osaki, Ikebukuro, Kawagoe, and Shibuya. The Narita Express which goes from Shinjuku Station to Narita Airport. Other Limited Express trains, including the Nikko/Kinugawa, Akagi, Super View Odoriko, Home Liner Odawara, Ome Liner, Azusa/Kaiji, and Shinjuku Wakashio. Odakyu Electric Railway’s Odakyu Odawara Line, serving the southwestern suburbs to Odawara and Hakone. Semi-express, rapid express, limited express, and local trains are available. Keio Corporation’s Keio and Keio New lines, stretching west to Hachioji. Local trains, as well as various distinctions of express trains, are available. Toei Subway’s Toei Shinjuku and Toei Oedo lines. Shinjuku Station has over 200 exits and 51 platforms. The station’s JR lines are located on eight ground level island platforms. These platforms are connected by two underground and two overhead concourses. The Odakyu station is located beneath its namesake department store, as is the Keio station. Other non-JR lines are also located in this subterranean area. In addition to being a busy train station, Shinjuku is home to a large bus terminal as well. The Busta Shinjuku is located atop the train station, serving long-distance highway buses and local buses. A JR Highway Bus Terminal can be found at the station’s New South Gates. You may wonder: does Shinjuku station have lockers? Yes, coin-operated lockers for storing your luggage are locked near most stairwells, escalators, and exits. To the west of Shinjuku Station is the “Skyscraper District,” the location of many of the city’s tallest buildings. The JR Shinjuku Hotel, as well as other elite hotels, can be found there, and the observation decks of the Metropolitan Government Office are open to the public. Shopping malls and department stores surround the station on all sides, including the century-old Isetan, the Takashimaya Times Square complex, and the multiple floors of the Odakyu, Keio, Lumine, and Mylord department stores. Many stores, such as Lumine, Yodobashi Camera, and Bic Camera, are located immediately outside the station’s exits. The so-called “red light district” of Kabukicho lies to the north of the station. The Kabukicho’s Golden Gai is home to more than 200 small restaurants and bars, and the Omoide Yokocho, translated “memory lane,” is a network of alleyways housing dozens of tiny ramen, sushi, and yakitori eateries. A number of parks are within walking distance of Shinjuku Station, including the Skyscraper District’s Central Park, and the Shinjuku Gyoen to the south. The Shinjuku Gyoen was formerly a garden of the Imperial family, but since 1949 it has been a favorite public cherry blossom spot. Where will your Tokyo travels take you? With your JR Pass in hand, you are equipped to explore this thriving neon city. I am going to Shinjuku from Narita on July 8, 2018. Do I have to book online? I read that the price will be 3190, but when I click book online, it goes to the oage where I have to buy the JP pass which cost me 260USD. I don’t think I will need JR pass this time. What should I do? Or can I buy JR pass for only two days? And only for going to Kawaguchiko?